0385 / It proved, however, microscopically normal in every respect. It proved, however, microscopically normal in every respect. For the photograph of one of those sections, now presented, I am indebted to the kindness and skill of Prof. J. W. S. Arnold, of New York... ¶ Though this picture is not an exception to the rule that photography offers a very imperfect means of representing the microscopic details of animal tissues, it may yet be regarded as of interest for two reasons: because illustrations of but very few sections through the fovea, schematic or other, are to be found; and because, in a photograph directly from the section, there can be no question of personal equation on the part of the draughtsman. 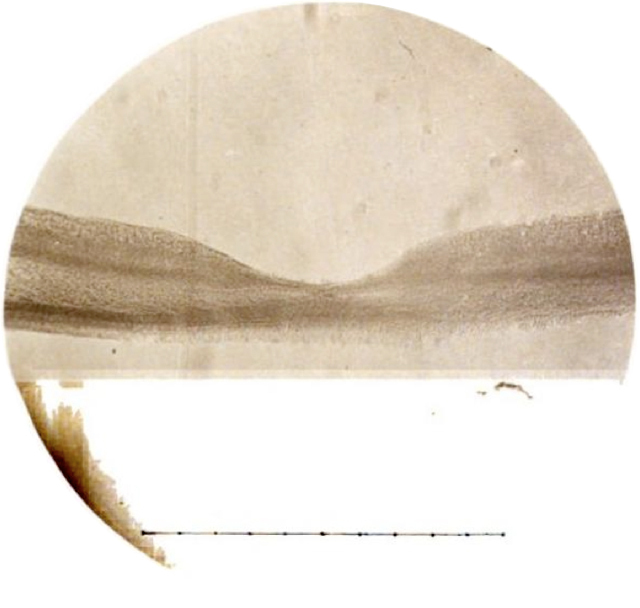 ¶ The section is from the eye of a girl of four years, removed in May, 1871, on account of a total staphyloma of the cornea so large as to be troublesome... ¶ The divided line beneath the section represents, as estimated by careful measurements, a length of 1 mm. in the actual section.